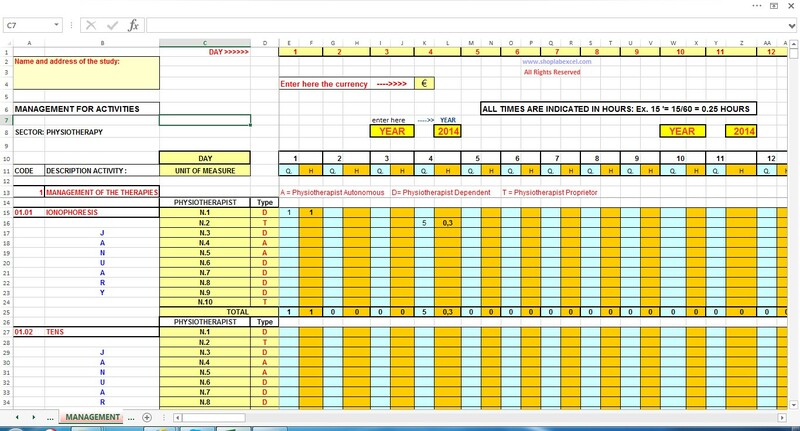 The file, in excel format, allows you to monitor the operational management and all economic activity of the Study of physiotherapy. It's useful for the management of the study. The price refers to the license for use for 9 years,non-transferable and non-exclusive,of the software for 1 user. It works with the OS Windows. There is also the ONLINE VERSION. To see it CLICK HERE. On the Home page you will also find other useful software for easy and economical management of your business. THE MANAGEMENT OF THE STUDY OF PHYSIOTHERAPY. The workbook can be used by physiotherapy studies, medical offices, gyms, beauty salons and the like, to monitor the activities of the persons conducting performance and the corporate economic performance. The voices of 34 activities can be changed depending on the sector, type and needs of each category of users. - 1 sheet for highlighting the contribution margins of each operator and each therapy. - 1 sheet for the management of the income statement monthly and annual of the study. The images hereinafter shown are only indicative and represent only partially the functioning of the worksheet. 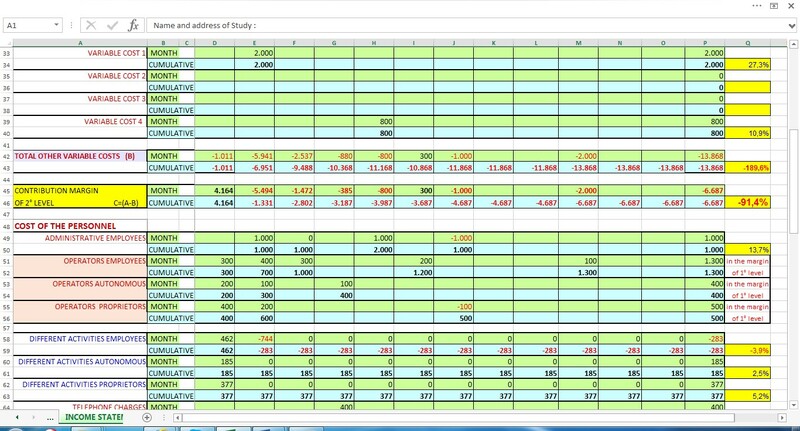 Picture n. 1 demo - (the collection, manage and process the study data - Calculation of contribution margins). The worksheet represented in the image is able to manage the activities of the study of physiotherapy for a period of 12 months, able to monitor the activities of 10 operators and of 34 types of physiotherapies and similar. - The quantities produced namely the number of physical therapies worked by each physiotherapist. Image n. 2 demo - Detecting of the variations of efficiency for each physiotherapist and for each performance from him executed. The image above highlights the ability to monitor all the activities of the physiotherapists and of detect for each of them the efficiency and inefficiency of their performance compared to the standard parameters set by management of the study. Of course, all the hours of work will have to be square with the number of hours of presence in the study, otherwise the any assessments of the results will be not reliable. The image shown above highlights the contribution margins (difference between the value of realized sales and the cost of staff: number of hours worked multiplied by the unit cost std of one hour) obtained, each month, by each operator and for each type of therapy. This table, called table of M.d.c. (margins of contribution) is a good tool of synthesis and overall assessment of the activities carried out in the Study. The contribution margin shown in the table is a contribution margin of 1st level. The contribution margin of 2nd level, which includes all other variable costs of the study not directly chargeable to physiotherapy, will be highlighted separately in the Income statement general. That is a prospectus that highlights, month after month, the economic results of the Study of physiotherapy. 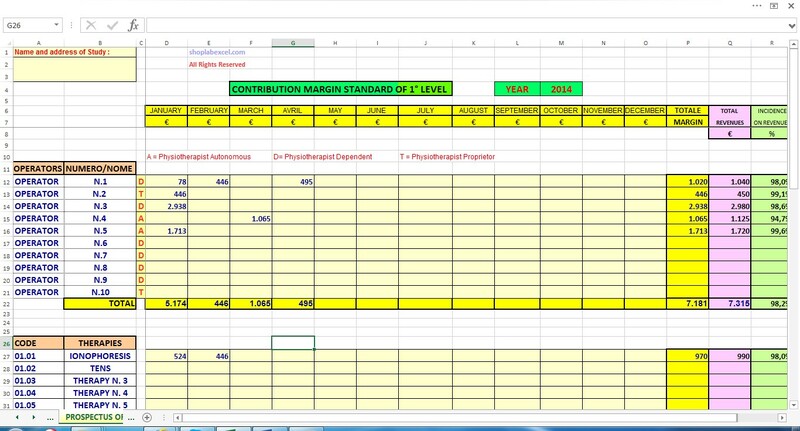 Indicates, at the top, the margins of contribution total (std) arising from the prospectus of synthesis of which was said previously, and lists all the other variable costs incurred by the study (including efficiencies and production inefficiencies) to get to the contribution margin of 2nd level. All costs are taken from the general ledger accounting of each month and are shown in the income statement in cumulative form. In the event that some costs are not available, for whatever reason, the owner of Studio will insert in the prospectus its personal economic evaluations of period, at condition, after, of carry out the adjustment with the actual data derived from the accounting. The prospectus highlighted in the image highlights all the fixed cost incurred by the Studio and, therefore, the total operating margin of the period, highlighting, also, with an indication of extraordinary income, of the charges extraordinary and of the financial charges, the result before taxes. Prima di tutto devo dire che i prodotti di questo sito sono stati realizzati, secondo me, da persone che conoscono bene la realtà delle aziende. Ho capito che questo software, se è adattabile anche alle palestre, agli studi medici, ai saloni di bellezza e di cura delle persone o a tutte quelle strutture che utilizzano diversi operatori per effettuare delle prestazioni, è sicuramente un ottimo aiuto per gestire tutta la struttura.Complimenti a l'autore di questo software. 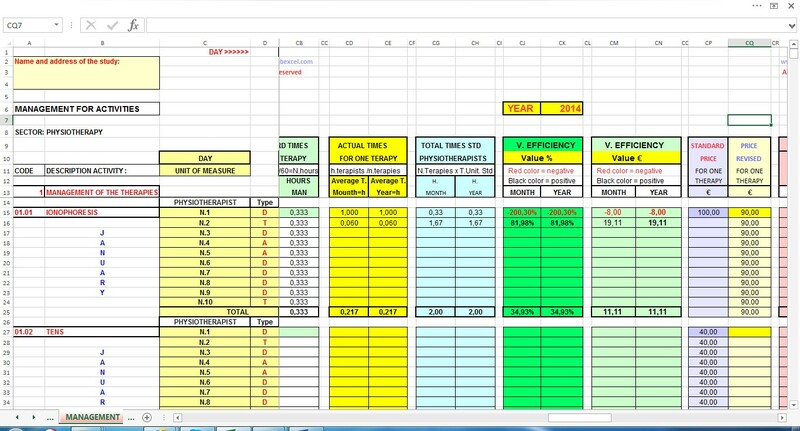 Thanks to the experience gained over the years, I have realized several working models in format excel and in format Open Office which may help companies to save time and money in their company management processes.